As you may recall, I made a goal earlier this year to complete 2 different case studies on NichePursuits.com. The first case study I'm doing is actually for 2 sites that I purchased earlier in the year. The second case study is for Vylo, a web-based voice chat software for gamers that Perrin and I are developing (with other partners as well). Today, I wanted to provide a monthly report for the 2 sites that I purchased. I keep monthly stats for these sites, and know that others find value in the previous monthly reports I've done for the Niche Site Projects. So, I'd like to get monthly reports going for these 2 sites, so that you can review my progress a bit better. In addition, these monthly reports can be motivational for both you and I, as I keep track of what is working and what is not. As a reminder, I purchased 2 sites; one that is primarily monetized by Google Adsense and one that primarily gets traffic from Pinterest. I am not revealing the URLs of these sites. The “Adsense Niche Site” I purchased in late January for $5,000 and according to the previous owner was earning about $400 per month. This site is based on an electronics product that you could find on Amazon. The “Pinterest Site” was purchased in late January for $2,100 and according to the previous owner was earning about $250 per month. This site is based on the crafting niche primarily. My goal for both of these sites is to increase earnings, and then likely re-sell them for a profit before the year is out. When I bought this site, it only had about 5 articles of content and was getting around 200 visitors a day. The primary strategy has been simple, build links to some of the pages to help them rank higher. Create new content based on related keywords to start drawing in more traffic from long tail keywords. The strategy has actually worked out okay, not stellar, but okay. The traffic has gone from about 200 visitors a day when I bought it, to about 230 or so a day on average. Not a huge increase, but its something. Unfortunately, this has not translated into an earnings increase. I am only going to compare April earnings with March earnings. However, the truth is that I want to get the site back up over the $400 mark. But I actually now believe that the site was only up at around $400 for the month of December and January (before I bought it). So, I may have bought based on higher than normal earnings. In March, the site earned a total of: $301.09 ($262.13 from Adsense, $38.96 from Amazon). In April, I decided to be more aggressive with Amazon to see if I could increase that side of the earnings. I created a comparison chart reviewing some of the top items in the niche and placed it predominantly on the homepage. So, $62.45 in Amazon earnings is a nice jump from $38.96…unfortunately this increase was offset by a bigger decrease in Adsense earnings. I was hoping that Amazon would bring in more money than Adsense eventually; but I can see that is not going to happen in this niche. 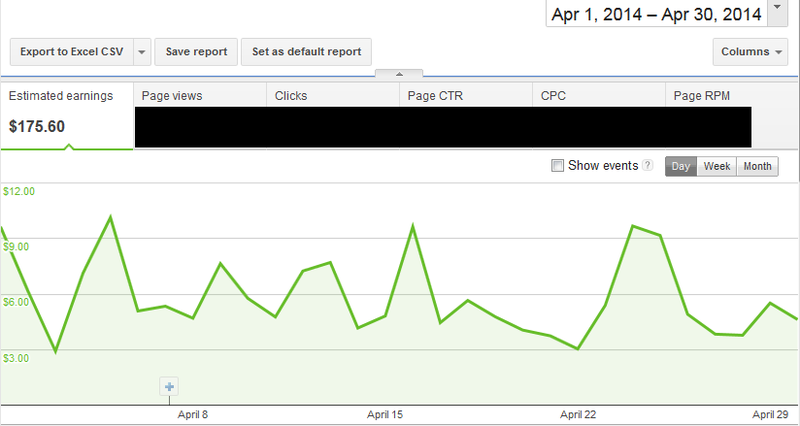 As a result of attracting more attention and getting more Amazon clicks, I got less people clicking on my Adsense ads. As a result, the Adsense earnings went from $262.13 in March to a measly $175.60 in April. Boo! The overall earnings of the site in April was $238.05. This is a decrease of $63.04. Ouch. As a result, I'm going back to making Adsense more prominent and will no longer focus on Amazon (although there will still be some links on the site). I did some quick calculations and discovered that each Adsense click is worth about 2 times as much as an click to Amazon for this site. So, this month will mostly be spent testing out different ads layouts to find out how I can get the maximum Adsense earnings with the traffic the site receives. Overall, not a great month for this site. The traffic was about the same as March; but the earnings were down quite a bit. I'll try to reverse that for May! For the record, from date of purchase until the end of April, this site has earned a total of $891.68. 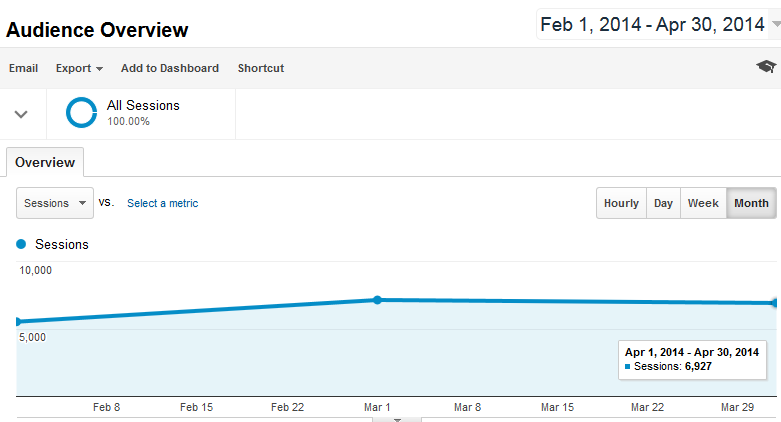 The second site I purchased, gets significantly more traffic…almost all of it from Pinterest. I've tried a number of things to improve the traffic and earnings, that I've covered previously here. I tried to get the site re-instated with Google Adsense; but its not feasible as explained here. I also tried to get traffic from Facebook; which worked to some degree; but is not worth the time and effort in my opinion. So, I can compare April earnings to something; here is the earnings from March. Oh and also remember that this site was earning about $250/month before I bought it. 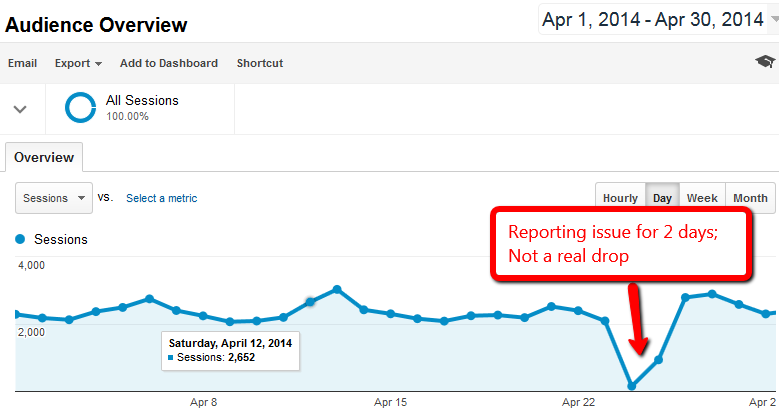 Unfortunately, the traffic was down a bit in April due to some site technical issues. I installed a plugin that caused some loading and other issues, and it took over a week to figure out what was going on. I also had an Analytics issue for a day or two which makes the traffic look much lower. However, the traffic was down close to 10%; primarily due to the technical issues. The good news is that all the reporting and site loading issues should now be resolved. However, the damage was done for April, and this is reflected in an overall drop in earnings for the month. So, the earnings decreased $55.24. Again, this is the wrong direction! During the month of April, we also played around with adding an email opt-in to get leads. I did add about 100 people to a mailing list; but have not done much with this list other than a couple of autoresponders. In May, I am basically going to just get more aggressive with the ad placement to generate more revenue that way. Because the traffic is not reliant on Google; it really doesn't matter if my ads are top heavy or anything else I might normally be concerned about. I will also try sending out an affiliate offer to the email list I've built. For the record, this site has earned a total of $766.13 since I through the end of April. Overall, the sites are still earning, but not at the level that I would like them to be. Both sites decreased in earnings from March to April; but I'm hopeful that I can reverse that in April. I would love to hear your thoughts on this monthly income report. If you have anything to add to the discussion, please add your comment below. Building Small Wins: Ryan McLean’s Niche Site Success Story! Hey Spencer, sorry to hear about the decrease in earnings. I’m sure you’ll find away to turn this around and I’m interested to see how! Of course you can trust Spencer. He surely knows how to turn negativity into positivity especially when it comes to making money with niche websites. BTW: I think it’s cool getting all your trafffic from pinterest. This shows that relying on Google for your livelihood is actually a wrong move. Social media is really powerful if you do it the right way. Thank you Spencer for an eye-opening income report. Great update Spencer! And thank you for sharing. I’ll be interested in seeing how well you can monetize that small list you have for the Pinterest site. I have a small list from my first niche site that I haven’t monetized yet, and it will be interested to see your results. It should be interesting; still looking for the right offer. Spencer – the sites are still earning which is a good thing, still motivaton for me to keep working on all of my sites, are you going to be accepting any new students to work on a new niche site. For sure; and these sites are a bit of a different situation as one is reliant on pinterest; and the other is more SEO based. I also have several other niche sites that Perrin and I have built from scratch that are growing…I’m not accepting students. The niche site project 2 student was a one-time deal. Thanks for sharing Spencer! Although the revenue isn’t heading in the right direction now, it’s good to see that things don’t always go as planned for other people, not just me! That being said it’s still only been a few months and I’m confident that you’ll still be able to increase the earnings. Great stuff! As much as I liked your previous case studies, I’ve enjoyed this one the most so far. I like the fact that you aren’t revealing the URL’s. I was always skeptical of true traffic and links for your previous studies because of niche pursuits popularity. I think this is the purest way to show step-by-step how building niche sites should be done. 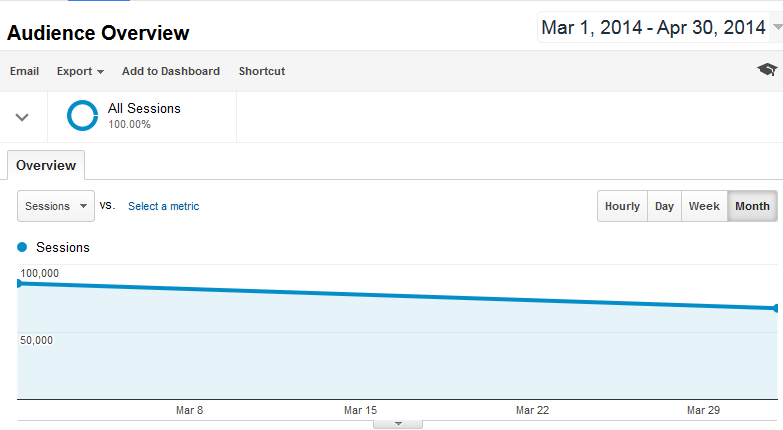 I recently had similar issues with Google Analytics where my traffic suddenly dropped to almost zero. I didn’t figure out why but I knew it wasn’t accurate based on social media metrics and adsense data. Did you figure out why you had a reporting issue? Cool…good to hear that you like this case study better! I don’t know what happened to GA, I think a plugin conflicted with my GA plugin. I just reinstalled a GA plugin when I noticed the issue, and everything is working again. Thank you for such a detailed case study of your sites. I have found also that strict focus on Amazon does decrease Adsense clicks and earnings. I use Pinterest quite a bit for my ebay selling but little sales come from it. Just wanted to leave a response, I like your reports and have subbed. Looking forward to future updates! Sorry to hear about the drop in earnings. I have seen a recent drop in my niche site earnings as well. So, as others have said it is nice to see that maybe it isn’t just me!!! Interested to know if the Niche Pursuits blog is gaining traffic or not recently. I would assume it is gaining traffic as it is truly an authority site versus our adsense smaller sites? Yep these sites have dropped a little, but I do have other niche sites that have a gained a little as well. NichePursuits is a slow grower; just due to its size. Its fairly large and does continue to gain traction in terms of subscribers and overall traffic; but not rapidly from month to month. This is a great motivation for me. thanks for sharing. Just curious is there a post outling any of the details surrounding the purchase of the sites? Such as where you bought them, things you looked at before contemplating the purchase, and how you arrived at the purchase price? Thanks for the update, it is nice to know that even at this stage of your IM career you still have to stick and move. At the end of the day you are still adjusting your strategies month to month—) which I believe is the best lesson for new internet marketers. This is a business and not a get rich quick that you can walk away from. How fast are you adding articles to the adsense site? Do you find that the quality of the content on the adsense sites matters as much than that of your authority amazon sites? Each site is a different beast; and that goes for any niche site. Yes, quality content is still important; its no different than an “Amazon” site because its all about ranking in Google no matter how you monetize. I added the 10 or so articles over a month period, I haven’t added articles since that. I’ve struggled to monetize sites with lower ad CPCs like your Pinterest/crafts site. So it would be really helpful to see how you complement monetization with email marketing. Especially when crafts seems like an obscure niche for an affiliate product. Good luck on bouncing back your earnings! Well like Edison said – providing what doesn’t work is as important as finding what does. Enjoyed the post though – it shows the volatility of the internet and the difficulty of making money at times. Although your niche site projects we’re terrific and have shown the potential of niche sites – my experience shows that earnings are typically around $100 to $250 per month with only the exception cracking the $500 and higher mark. Yep, it all depends on the niche and the site. This is really a great share, i get alot of infos, i just want to ask how you get all this traffic from Pinterest, you use some Bot? or you have alot of followers? thank You Spencer. We pin all our images from each article; and we have a few hundred followers. For your Pinterest site, are these images of products? Are they your own images? Hi Spencer. Thanks for sharing your experience of buying sites that don’t quite meet the proported earnings stated, this has been my experience also but I am learning to be more vigilant and improving my site slowly. I’ve purchased a new gtld and am testing it out. Its still too early for me to say. I’m still most comfortable with .com, .net, and .org. Great info…I always learn and I thank you for sharing all this informative insight in your simple and effective way of teaching a green horn like myself…I will keep on keeping on !!! You can rank the Pinterest account on Google for it’s keyword .If the website is linked to the pinterest account, it will be like having the website ranked for no.1 or no.2 in the google because the website link will always show under your pinterest account under google snippets and ppl will click on it. This is a clever way to get around google penalty Also, try building up a google plus account and focus on getting as many plus ones as possible for singular posts. The plus one’s may even lift your penalty, if you get enough. I would also building a twitter account and connecting it to your website. But you have to know how to build an audience on social media. I am stunned that you can make $250-$300 on adsense with 250 visits per day.My website gets around 350 visits and the most I make is around$60-$80. It really depends on the keywords/niche…some make more; some make less. Spencer, how much time do you think you are spending on these sites personally? How much cost has gone into new content, link building (if any), software, and outsourced labor? I know you are doing this as a model, and I get that. I hate when people ask about our expenses as well. In this case though, I do wonder if your time is better spent elsewhere. I don’t spend much time. Maybe 5 hours on each site over the past few months. There has been a few hundred dollars spent on either content or other outsourced labor though. So very little of my time is spent on these sites; however, I agree that these are the most profitable sites in the world either. I’m using these as a way to learn the ropes with buying and improving sites. In the future, I may venture into larger properties based on some of the principles that I learn through this case study. Great and straight forward report. This shows that things may not always go the way preplanned and that we keep leaning. It seems to me that building a niche site from scratch is a better way to go except that the goal for this is to make a case sturdy public. It looks like a trend that March and April’s AdSense earnings are lower than usual for many niches. May’s statistics look promising again, at least in case of my sites. Hi there Spencer 🙂 have you done any case studies on selecting adsense keywords with LTPro? would be great to see how you use the tool for this . Andro, yes I know I’ve made lots of videos; but its been a while. The process is the same as I’ve done for my 2 niche site projects; but I typically focus on keywords that have a cpc of $1 or more. (Although that could be less if it gets higher traffic). Hello Spencer, in your topic you said you’re going to focus on Adsense more than amazon, is this only for these 2 websites you bought? or in all websites? do you mean earnings from Adsense more better than Amazon. sorry for banche questions but i’m willing to built some websites and i’d know which better, i was following our projects and the one with Perrin impressed me, and planned to make Amazon niche ones, but now im little bit confused, what do you advice me? and thank you, hoping to get incease on earnings again. I mean for the 1 website I was writing about – the Adsense niche site. I still actively build both Amazon and Adsense niche sites – both are great avenues; neither one is better than the other in my opinion. Would definitely want to see what happens if you split test amazon VS Adsense. The drop of adsense revenue, when combined with Amazon affiliate links was mentioned also in a recent episode of the Empire Flippers. They’ve mentioned the exact same trend. I might need to consider experimenting with my one site that makes some money from both. Hey Spencer, good income report. Quick question, what are the things you look at when purchasing a website? What is your strategy for buying websites? Are you using online market places or manual search? I think it’s awesome that you could buy a site with only 5 articles and 200 visitors per day. That is pretty impressive. I bought one on Flippa; the other was a private purchase (seller contacted me). I am waiting for Spencer to tune the site. First purchase site earnings from $400 to $4000 and second site earnings from $250 to $2500. Love from you, Spencer soon. Sorry. Love news from you, soon…. I think I need to arrest you, Spencer. Yeah! I need to…. Just pulling your legs. You have told us all the secrets. I laughed when I saw your reports of the 2 sites and cried for myself because I am yet to start. But all the same, I already on. Thank You Very Much for all these. I really appreciate all your efforts. I know you can change those two underfeed giants into money making mac-beasts(My New English – Combination of Machine and beasts). So, I can’t wait to see you turn them around. Thank you for your updates, Spencer. Hope your sites will perform better in May. BTW, I want to tell you that after 6 months effort, I earn my first dollar from my niche site finally. So, thank you for your blog which sharing everything about niche website. It really inspires me to start my niche site business. Thank you, Spencer. Congratulations to you,man. Eventhough your income for the sites decrease but they still making money. I ‘m sure you are going to make more money in May. You did mention several niche projects with Perrin. Why don’t you start posting on that. You don’t have to mention the niches but the income and type of links that you’re building will do. We just want to know if niche building is still working in 2014 and how big it can grow? Great Case Study Spencer! Little off topic but How are you logging in your Adsense account after being banned? I know you wrote about it but I heard they track IPs. Any recommendations after being banned with my IP? Should I get a private proxy and keep logging in from that? I waited over a year to login to my adsense account from home (I would login at other locations/ips though). I think Google has gotten less strict now about closing accounts; so I do login every now and again from home…and haven’t had issues. So you login from your old Banned IP after a year from using what other IP? Did you use a Private proxy around your city or it doesn’t matter as long as it is not banned? Also, can I work on my websites from my computer that got banned from Adsense as long as I don’t login with new account on banned IP? Just Login with Private Proxy? To clarify, I don’t think your IP gets banned; your adsense account gets banned. I just stumbled upon your site by accident. This is cool stuff! I have a couple niche sites that I built myself. Most have similar results (in the couple hundred a month range) one of them does a pretty consistent $1k/month. I love your breakdowns and transparency! I’m bookmarking your site and will be checking back. Very cool stuff. Wow, finally I saw someone just starting with a niche site. It will be more interesting to see the development of a new site than those already established. I have a new blog too http://www.iloveyoumomforever.com, it’s not earning yet but I know I will be there too. I will be following your steps brother… Thanks for inspiring… Good luck! I’m going to change everything and use a NEW IP address (VPS Hosting) so when I update my niche website with content, adsense codes do I keep using the same IP just not the one I got banned? Would it be a red flag if I registered my new account at my boyfriends home and use my VPS at my home? Thanks for sharing your good income report. Reality speaks for itself that results are indeed unpredictable. But still, you do website optimization better.